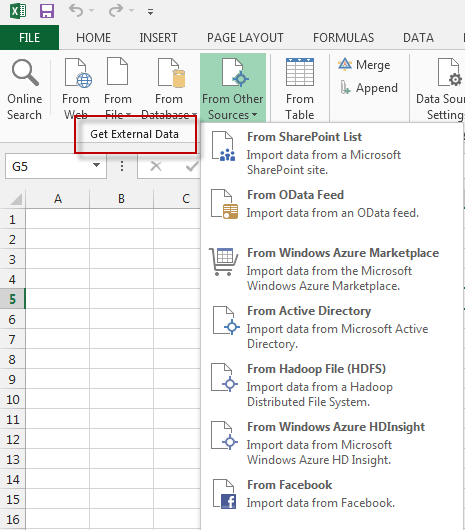 In this post, I’ll discuss the prerequisites and how to install and enable Power Query (Data Explorer) and I’ll show you how to use this new feature. Requires Windows Vista (with .Net 3.5 SP1 or greater), Windows Server 2008 (with .Net 3.5 SP1 or greater), Windows Server 2008 R2, Windows 7 or Windows 8. 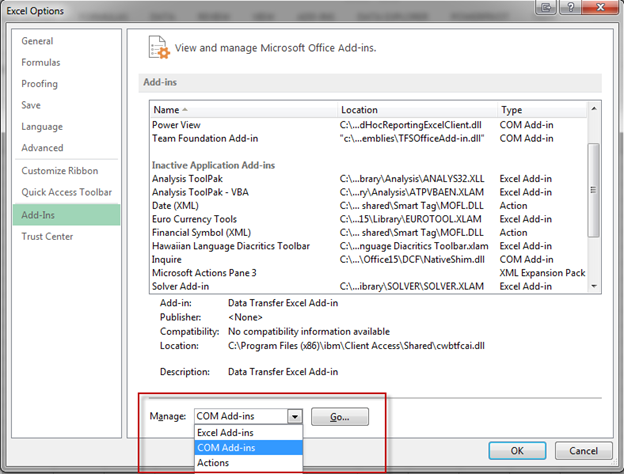 Once the feature is installed open Excel and go to File, Options, Add-Ins. Select COM Add-Ins and click Go. Check Microsoft “Data Explorer” Preview for Excel and click OK.
Once Data Explorer has been enabled, the tab will appear above the Office ribbon. Now that we have Data Explorer installed and enabled we can get to the fun stuff. If you click on the Data Explorer tab you will notice Get External Data. Just like Excel and PowerPivot, this is where our data source will come from. There are multiple data sources to choose from including websites, files, databases, Active Directory, and even Facebook. Yes….Facebook. In this tip, I’ll show you examples of two data sources. 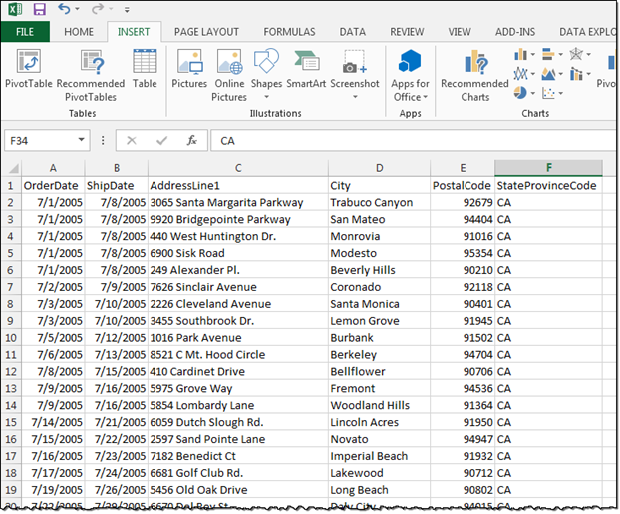 We’ll pull data from a website and create a map report using PowerView and we’ll pull data from Facebook and make a report using PowerPivot. 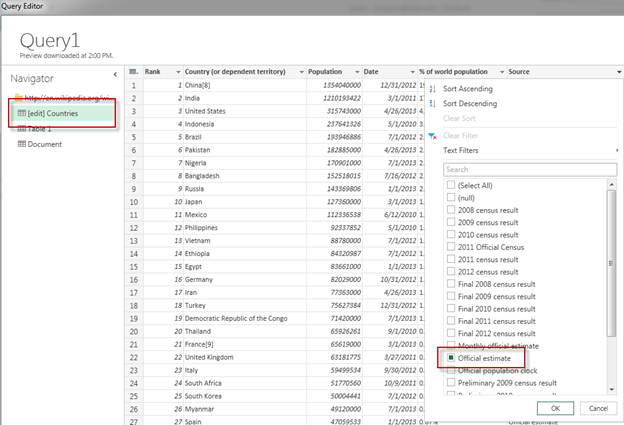 In the Query Editor under Navigator, select Countries. This will display rank, country, population, date, % of world population and source. We can filter columns just like in Excel by selecting the header arrow and choosing the appropriate filter. In this example, we’ll filter Source to only includes records that are an official estimate. 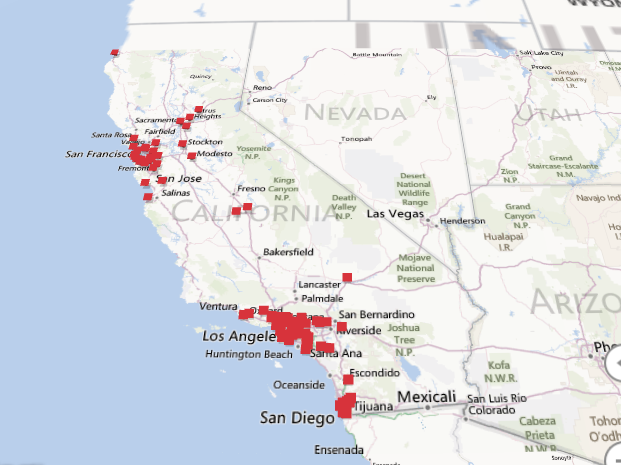 Microsoft has introduced a new BI product that will provide 3D data visualization using Bing Maps. This product is still in beta and is codenamed “GeoFlow” but should be out late 2013 or early 2014. 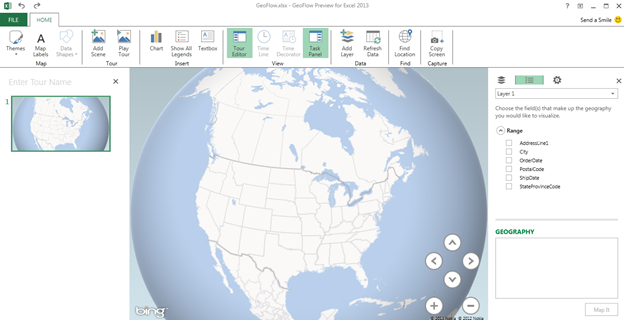 This preview will allow you to plot geographic and temporal data visually, analyze that data in 3D, and create visual tours. It is a really cool product and I can’t wait to use it in a business atmosphere. In this post, I’ll discuss the prerequisites and how to install “GeoFlow” and I’ll give an introduction on how to use this feature. Now that “GeoFlow is installed, we can begin using the new feature. There are a few tabs you can use right away in the ribbon bar. Under the “Map” item you can change Themes and add Map Labels. I like to enable the Map labels so I can see a more detailed version of the map. 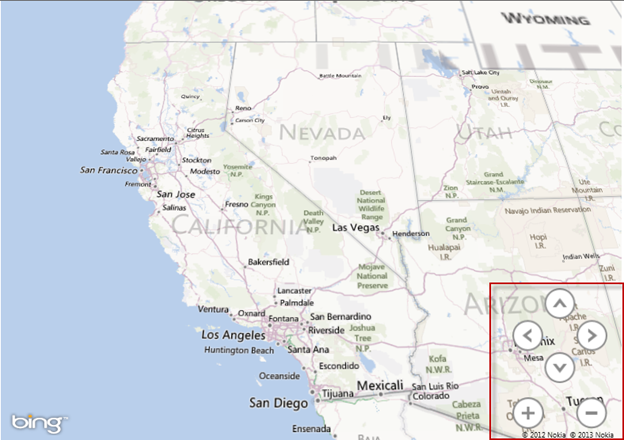 You can also zoom in and out and move the map using the arrows and +/- buttons in the bottom right corner of the map. 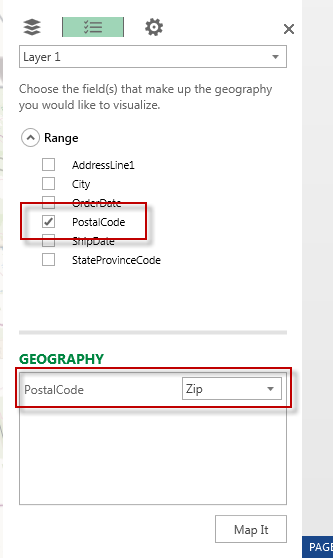 Once the fields are selected, click Map It.